In a large saucepan, saute the garlic, pepper, and onion in oil until fragrant, about 5 minutes. Add beef and saute until brown, stirring to break up the meat. Add the remaining ingredients. Saute, stirring occasionally, about 20 minutes, until thickened. I served mine sprinkled with cheddar on sesame rolls. Sorry about the unexpected hiatus! 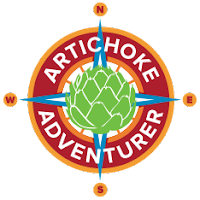 I've been busy developing recipes for clients, making dinners that have appeared here before and going out for exciting dinners with friends and for our tenth anniversary. Excuses, excuses! 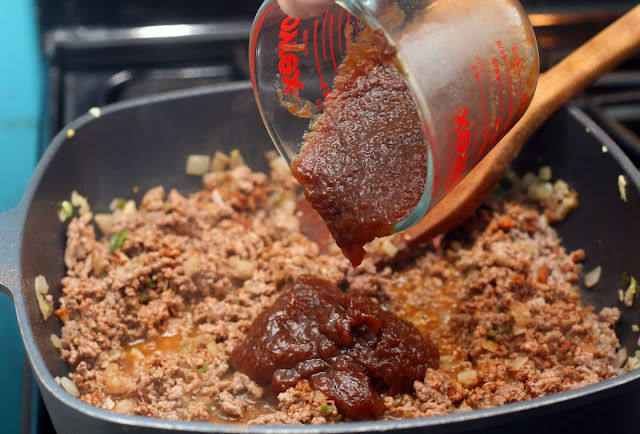 I'm back now and bringing you this new recipe for Sloppy Joe's my mom has deemed Sloppy Johnny's after her childhood interest in Johnny Appleseed because they feature apple butter. 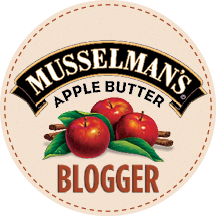 I was lucky enough to have been contacted by Musselman's to become an apple butter blogger in 2015. I love apple butter so much, we go to the Apple Butter Festival in Berkeley Springs, WV each year despite it being two hours away. 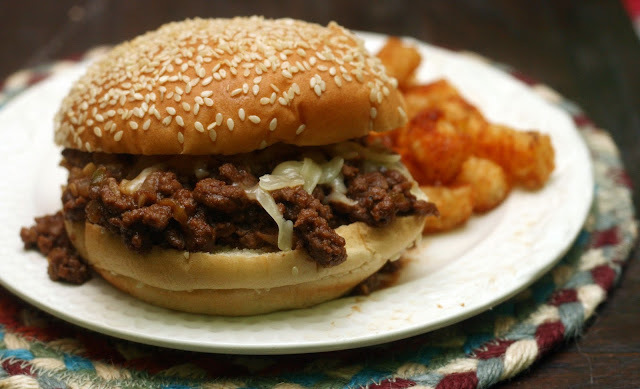 Musselman's Apple Butter is sweet, of course, but it also has a great spicy note to it that really lends itself to savory applications like these Sloppy Johnny's. Apple butter is more than just a spread. Normally I use tomato paste in Sloppy Joe's but the apple butter is thick enough to serve as a substitute. I added some serrano peppers, mustard powder and ground chipotle to kick up the heat and complement the ginger and cinnamon flavor of the apple butter. This made it a Sloppy Joe that was not only suitable for children but for adults as well. Check out the Musselman's Apple Butter Pinterest account for more ideas. In a large bowl, mix together the coconut, salt and sugar. Then stir in (or beat in with the paddle attachment if using a mixer) the cream and then the vanilla paste until a firm, sticky, paste-like mass forms. Set aside. Whisk together the cinnamon and cocoa in a small shallow bowl. Set aside. Use your hands to form 1 1/2-2 inch long ovals out of the coconut mixture. Roll in the cocoa mixture to coat. Repeat for remaining coconut mixture. 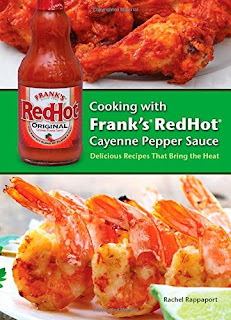 *This recipe uses a lot of cinnamon, if you have a Costco (or similar warehouse store) membership, good quality cinnamon can be purchased there quite cheaply. Growing up I had a friend who's mom would make homemade candy for every holiday. Tons of fudge for Christmas, homemade candy eggs at Easter and at St. Patrick's Day, Irish Potato Candy. I hadn't thought of them in years but after passing the remnants of the St Patrick's Day parade this weekend, I got to thinking about how odd it was that I see so many references to corned beef and cabbage; whiskey, beer and Irish soda bread this time of year but no real mention of Irish Potato Candy. I came home and googled it and it turns out there is a reason I don't hear much about the candy; it is a regional treat central to Philadelphia! Well, Baltimore is not Philadelphia but we are only 1 1/2 hrs south and have a good sized Irish-American population so it makes sense they'd trickle down here, even if in just in homemade form. 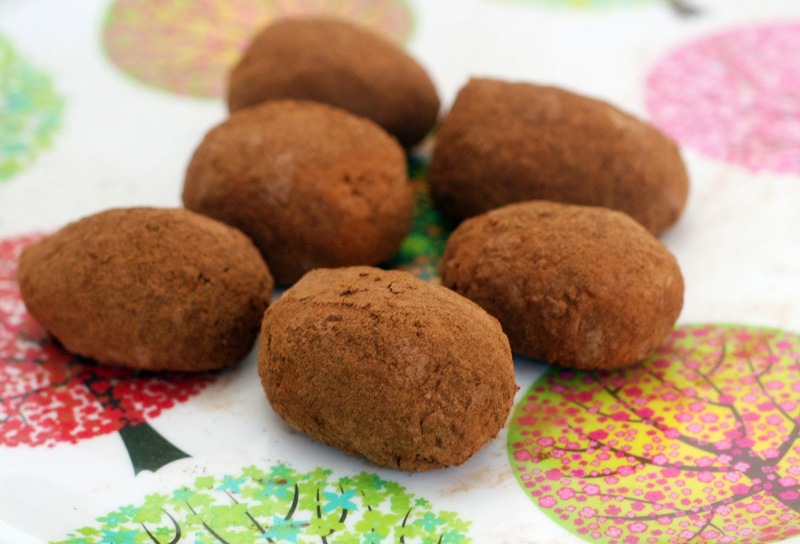 Despite their name, they don't have potatoes in them, they are coconut candies rolled in cinnamon to mimic a potato pulled fresh from the ground, still covered in dirt. This article in Serious Eats gives a good overview of the history of the candy and a behind-the-scenes peek at the Oh Ryan's Irish Potato factory in Linwood, Pa. I made mine to the best of my memory with a bit of a tweak: instead of just cinnamon, I coated them in unsweetened cocoa as well. I like cinnamon, but straight cinnamon is a bit overwhelming. You could also dip them in just cocoa powder, the effect will be the same. I did read about cream cheese versions, but I am sure the ones I had years ago did not use cream cheese so used heavy cream instead. The lack of cream cheese also means these can be stored at room temperature, in a sealed, air-tight container, up to 5 days but I will say they are best consumed the first day or two. Boil the potatoes in a large pot of water until fork-tender. Add the green beans for the last 2 minutes of cooking. Drain and allow to cool to room temperature. Toss with the radish. Set aside. Whisk together dressing ingredients. Drizzle over salad and toss to coat. I was excited when Spanish Black Radishes showed up in my produce boxI was excited when Spanish Black Radishes showed up in my produce box one week. I had heard of them before but I had never had the chance to try them, they are a late winter radish and winter farmers markets are rare here in Baltimore. I was surprised when they showed up and they were huge! One radish (the one I used for this dish) was over half a pound and at least the size of softball. I had heard they were quite pungent so I grated it and made a salad with milder ingredients to balance the flavor. I found they smelled stronger than they tasted; it was sort of like fresh horseradish crossed with a regular radish and with the texture of a rutabaga. I loved the textures in the dish, the crisp beans contrasted nicely with the creamy potatoes and shredded radish. 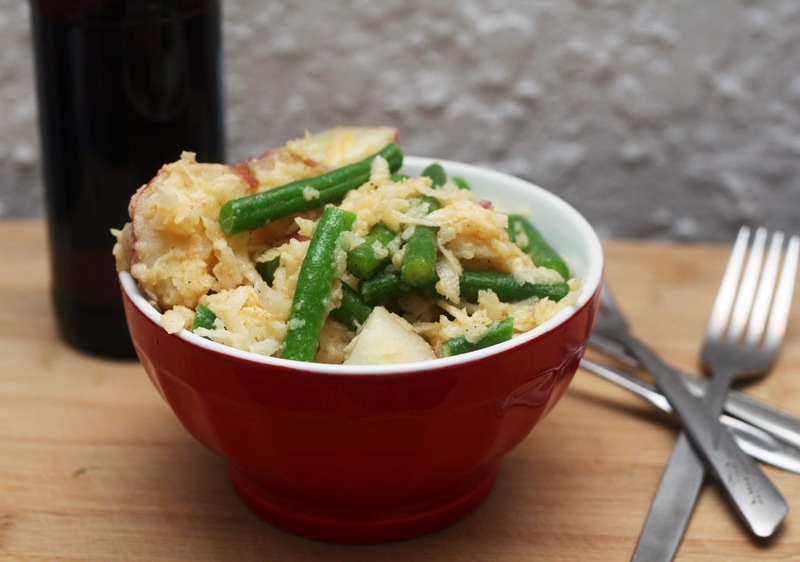 A great side dish to help you transition into spring. Preheat oven to 350. Line a baking sheet with parchment paper, set aside. Stir together the dressing ingredients. Spread a thin layer of dressing on the bottom half of each roll. 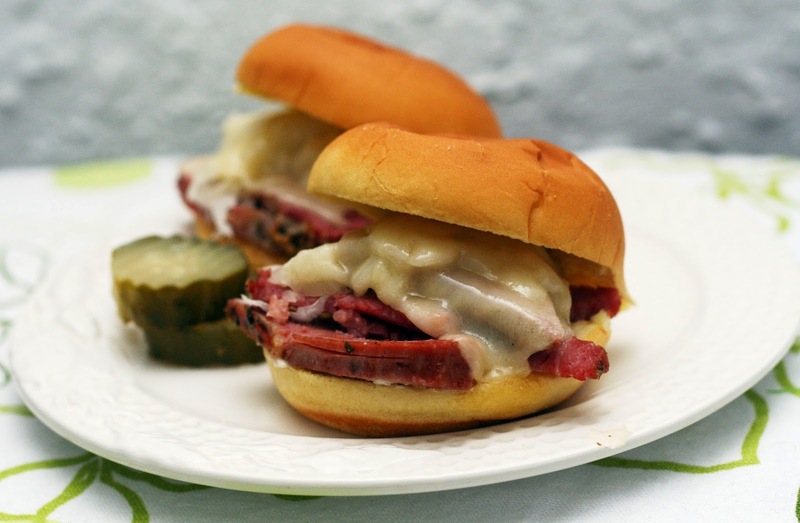 Top with sliced corned beef, a bit of sauerkraut and a slice of Swiss. Place on the baking sheet. Bake for 5 minutes or until the cheese is fully melted. Serve immediately. *I heated the corned beef for 4 hours on high in the slow cooker. I'm always excited this time of year because between St Patrick's Day and Passover brisket and pre-corned beef is always on sale pretty cheaply. I like to stock up and freeze some for later in the year when it is a little more difficult to find. This year I kept it simple and made sliders; in previous years I made corned beef and cabbage bao and corned beef stuffed cabbage (among other things, check out my corned beef Pinterest board) but they were very good. Matt isn't the biggest Reuben fan (I agree, putting cheese on corned beef sounds wrong) but even he liked this version. The homemade dressing really makes it; it pulls together all of the pickling flavors and is much fresher tasting than the bottle stuff. Cook the bacon in a non-stick skillet until crisp. Remove the bacon and drain all but 1 tablespoon of fat from the pan. Add the pimento, garlic and shallot and saute until the shallot is translucent, about 5 minutes. Add the wine or lemon juice and cook 2 minutes or until dissolved. Remove from heat and cool. 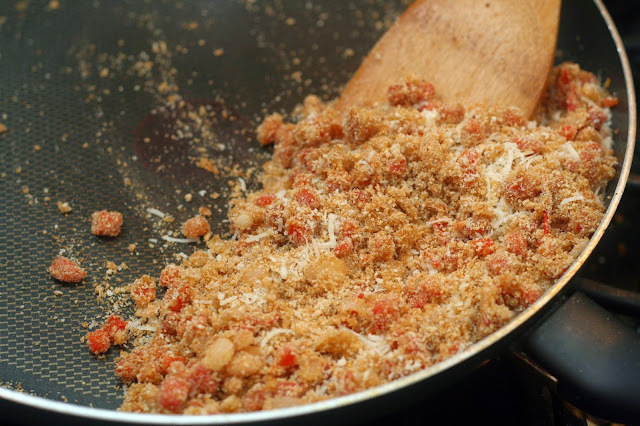 Stir in the parmesan and bread crumbs. Meanwhile, steam the clams in 1 cup water, for 3 minutes. Remove the top shells and places the clams on a baking sheet. Spoon filling on each clam, top with bacon bits and then bake 10 minutes. Serve hot. Growing up in Baltimore and spending most of my days (even vacations) on the East Coast I've eaten a lot of seafood. Baltimore is the land of oysters and crabs but clams are also popular here and in the surrounding states. Clams Casino is a personal favorite that hails from just a bit further up the coast in Rhode Island. It can be found on menus up and down the Atlantic. There are a few variations (I even had a Clams Casino pizza this weekend!) but the basics are the same; clams, bacon, bread crumbs, peppers and shallot or onion. Most recipes call for bell peppers but I like using diced pimento, not only is it perfectly pre-diced, the pimento is peeled so you don't get bits of skin in your final dish. Anyway, I've been looking for an excuse to make Clams Casino for years so when Lay's brand contacted me about new flavors of potato chips, I knew this was my chance! I loved prawn cocktail and chicken dinner crisps in the UK so I was sure other complex flavors can make a great chip. 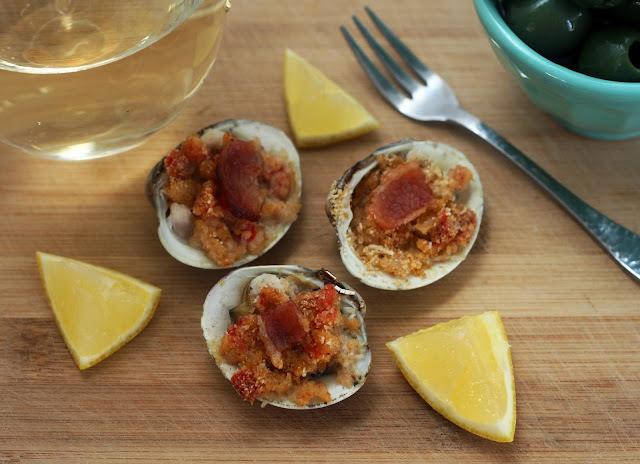 The classic, regional flavors of Clams Casino would translate just as well to a chip as they did the pizza I had on Staten Island this weekend. Fresh, crisp, briny, oniony with a hint of pepper; what more could a seafood lover want more? Check out Lay's "Do Us A Flavor" Contest to see official contest rules and submit your own winning chip idea for a chance to win $1 million! Combine all ingredients in a medium bowl until evenly distributed. Form into 4 equal patties**. Heat a small amount of canola oil in a skillet. Cook 2-3 minutes on each side or until cooked all the way through, adding cheese slices in the last minute of cooking. 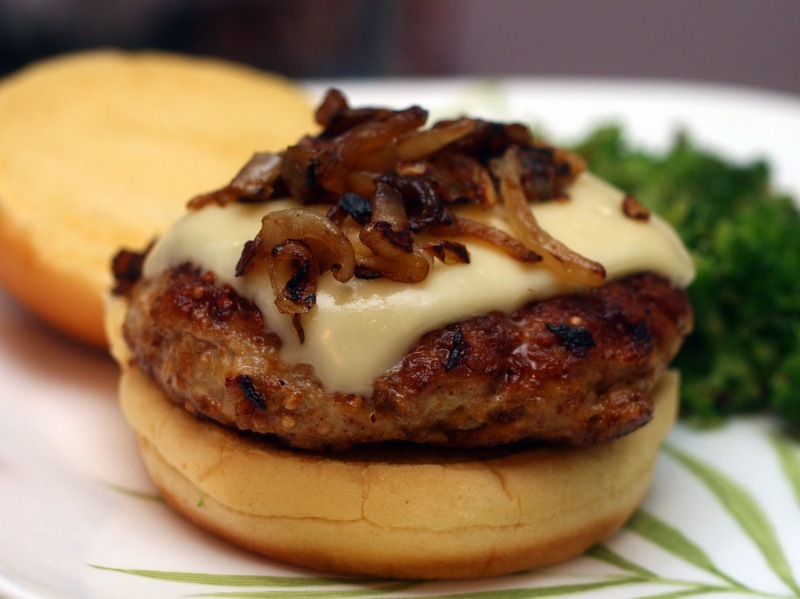 Serve on buns and top with caramelized onions. One good thing about snow days is that Matt works from home and has taken over some of dinner duty. He came up with the idea of chicken burgers filled with pretzel crumbs and mustard and I helped him refine it. Chicken burgers can be tricky because ground chicken tends to be damper and stickier than beef so I didn't want to add too much in the way of wet ingredients so we used dry mustard and garlic powder instead of fresh mustard and garlic. Chicken burgers can be on the bland side but these were anything but bland! The mustard powder and seeds added a lot of flavor without the whole burger tasting just like mustard and the pretzel was a fun alternative to breadcrumbs (and there was no reason to add additional salt!) and added a bit of pretzel to every bite. I think it was the best chicken burger I've ever had! Oh, and I know some of you have said you have a difficult time finding ground chicken, ground turkey would work too! Preheat the oven to 350. Line 2 cookie sheets with parchment paper. In a medium sized bowl, whisk together the dry ingredients. In a large bowl, cream the butter and sugars until light and fluffy. Add the egg, zest and vanilla paste and combine thoroughly. Gradually add the dry ingredients to the butter mixture and mix until a very thick dough forms. Fold in the chips. Form cookies by dropping 1 teaspoon of dough (I use my on the sheet two inches apart. Flatten slightly then bake until light brown, about 12 minutes. Remove (using a flat turner or spatula) to a wire rack to cool. One tip: The center of these cookies should look slightly soft (but not shiny) when they are ready to be taken out of the oven. The trick is to take them out when their bottoms are just lightly brown-generally at exactly 12 minutes. They will set up as they cool. If the cookies are large, slide them out on the parchment paper and allow them to cool 1-2 minutes on the parchment on the wire rack before removing the parchment and allowing them to cool directly on the wire rack. This weather (still snowing and icing in March, really?) has my cooking down. I keep having to scramble together to make dinner and haven't been super inspired. Then I had a sunny respite in Orlando attending the Food Blog Forum where I ate and drank my way through all of the countries in Epcot except Morroco and England. So fun and food-inspiring! Unfortunately, I had to return to Baltimore just in time for an ice storm and now snow. My savory ideas will have to wait. 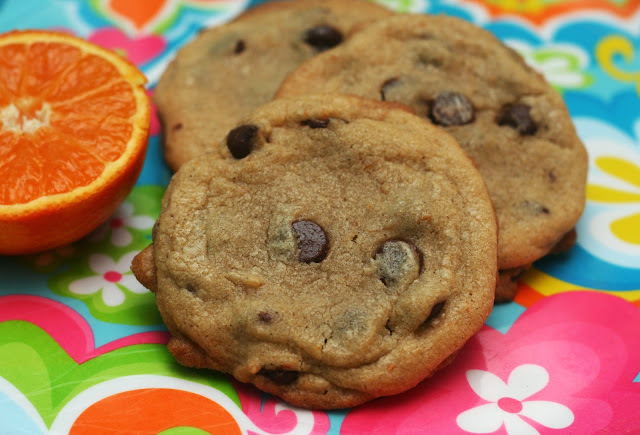 I did have all the ingredients for cookies on hand so I whipped this up this dreary afternoon. I added a bit of sunshine by way of the tangelo zest and since I love citrus with five spice powder, I tossed some in too. I added chocolate chips because, why not? I like non-chocolate cookies but honestly, I always want a bit of chocolate after eating one. Don't you? Try these cookies when you need a bit of a pick-me-up.